Washington squanders an early two-goal lead but regroups to beat the Bruins. BOSTON – A late-period score and blown lead could have been enough to send the Washington Capitals to another road loss in this up-and down-season. But now things may be turning at the right time. Following a comeback win over Tampa Bay at home two days earlier, the Capitals blew an early two-goal lead but recovered to beat the defending Stanley Cup champion Bruins 4-3 on Saturday. The Capitals jumped ahead 2-0 in the opening 8:15 before giving up a score with 5.6 seconds left in the first period and allowed the tying goal in the second. “It’s a coach’s worst nightmare, giving up a late goal, and they tied it later, but the guys just kept pushing,” Capitals Coach Dale Hunter said. Alexander Semin had a goal and set up Jay Beagle’s go-ahead score, leading Washington to its second straight win after a three-game losing streak (0-2-1). It was Washington’s 12th road win of the season in 33 games (12-18-3). The Capitals moved two points ahead of Winnipeg for sole possession of eighth place in the Eastern Conference. Washington also trails Florida by one point in the Southeast Division. 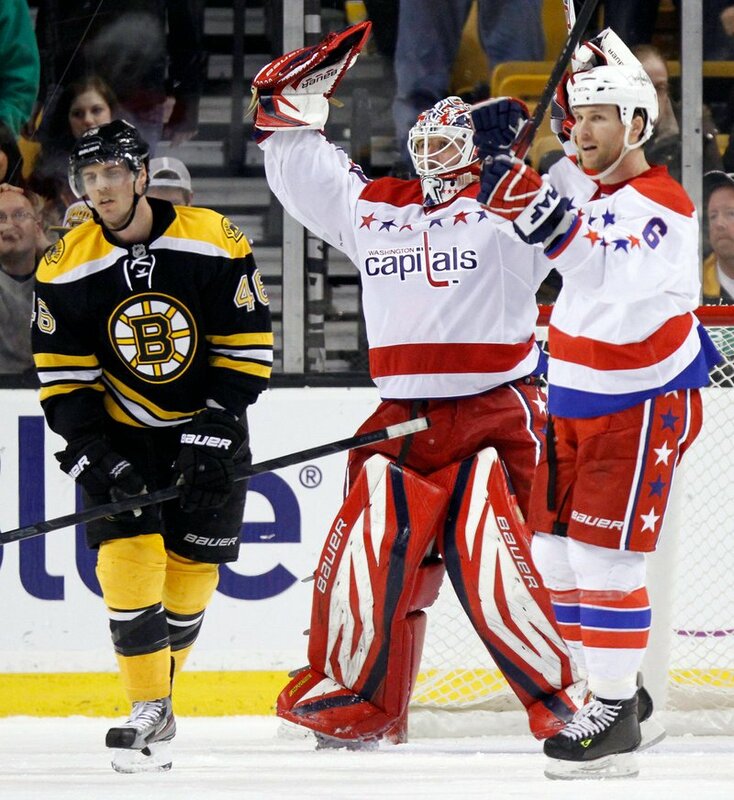 Brooks Laich and Matt Hendricks also scored, and Tomas Vokoun stopped 30 shots for the Capitals. Brad Marchand, Milan Lucic and Johnny Boychuk scored for Boston, which failed to extend its winning streak to three games for the first time since late December. Tim Thomas, playing in his eighth consecutive game, made 26 saves for the Bruins. Bruins Coach Claude Julien was upset by his team’s effort and concentration at the beginning. The first two goals came off rebounds. “We talked about it before the game — they’ve got some guys that are dangerous there. To me it was just careless,” he said. Washington improved to 20-0-0 when it leads after two periods. Boston tied the game at 2-2 on Marchand’s goal 4:58 into the second before the Capitals scored twice over the final 8:38 to take a 4-2 edge into the third. Seconds after the Bruins killed off Greg Zanon’s holding penalty, the Capitals kept the pressure on and Beagle scored on a wrister in the slot off a pass from Semin. They made it 4-2 on Laich’s power-play score late in the period when he redirected former Bruins defenseman Dennis Wideman’s shot past Thomas from the slot. Mike Knuble misfired on a chance to give the Capitals a three-goal lead. He hit a post with just over 7 minutes to play. Boychuk then cut it to 4-3 when he came charging in to score off a rebound with 3:13 left in the third, scoring in his second straight game after not getting a goal since Dec. 3. The Bruins pulled Thomas for an extra skater with 1:20 to play, but Washington held on despite a pair of chances on scrambles in front. Marchand tied it when he collected a loose puck at center ice after Jordan Caron checked Ovechkin into the boards, sending the puck free. Marchand skated in alone, waited and slipped a shot between Vokoun’s pads. The Capitals scored a pair of goals 25 seconds apart in the opening period to grab a 2-0 lead. NOTES: Injured Bruins goalie Tuukka Rask, out 4 to 6 weeks because of a lower abdomen/groin strain, said it’s “probably closer to six weeks than four. That would be right around playoff time.